I'm back with another makeover. This one was a bit impromptu. My co-worker asked me to make her over for a charity event she was attending after work. We went for a pin-up look and I actually remembered to take a before and after. Fortunately, my co-worker is also a product junkie and she buys a lot of the stuff I rave about, lol. I ended up using a lot of her own makeup and just supplemented it with items from my kit. We set up shop in our conference room and I went to work! 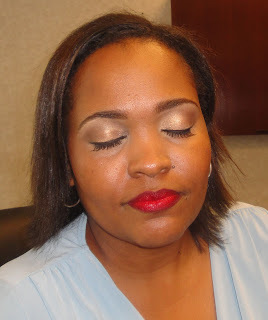 She's not afraid of a bold lip so we went for a pretty neutral eye with lashes and stunning, red lips. My co-worker loves makeup but isn't used to wearing a lot. 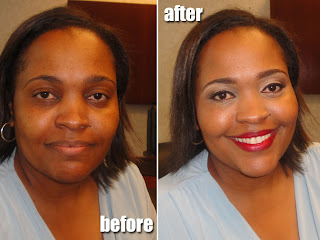 When this is the case with a client, you may need to do a check after the makeup is applied and tone down some things. For example, with eyeshadow, if it's too vibrant, just take a clean blending brush and swipe it over the lid a few times. It will immediately make the look more subtle. Love what you did here! Looks like you had to do some brow grooming, too? Looks great! agreed great before and after! I agree! Her eyes look amazing. She looks very pretty. Glowing!